Iranian President speaks to French counterpart, says it's impossible for Tehran to stay in the nuclear deal if it cannot benefit from it. 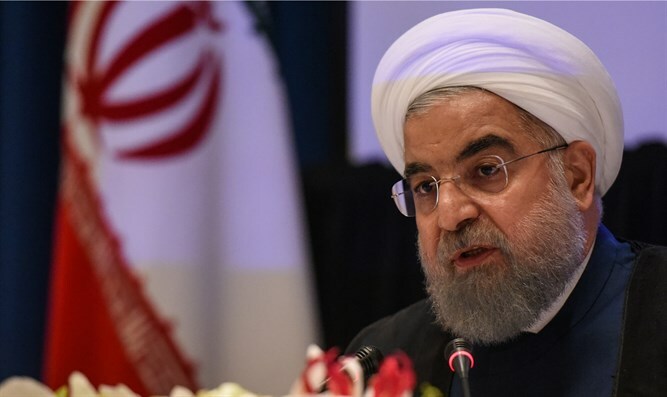 Iranian President Hassan Rouhani warned world powers on Tuesday that it was impossible for Tehran to stay in the nuclear deal if it cannot benefit from it after the U.S. withdrawal, Reuters reported. Tehran has demanded that Europe come up with an economic package to offset the effects of the U.S. withdrawal. “If Iran cannot benefit from the (nuclear) deal, then it’s practically impossible to stay in the accord,” Rouhani was quoted by state news agency IRNA as saying on Tuesday in a phone call French President Emmanuel Macron. The pact between Iran and world powers lifted international sanctions on Tehran. In return, Iran scaled back its nuclear activities, increasing the time it would need to produce an atom bomb if it chose to do so, a goal it denies having. Macron’s office said he had told Rouhani in the same telephone call that France remained committed to the nuclear deal but Tehran needed to fully comply with its commitments. “The President of the Republic recalled the will of France, Britain, Germany, Russia and China, to continue to implement the Vienna agreement in all its dimensions,” Macron’s office said. “The president informed President Rouhani of the progress in the work being done on our side. He hoped that Iran, for its part, will fulfill its obligations without any ambiguity,” it added, according to Reuters. Last week, Iran notified the International Atomic Energy Agency (IAEA) that its Atomic Energy Organization is opening a center for producing new centrifuges for uranium enrichment at Natanz. French Foreign Minister Jean-Yves Le Drian later warned Iran that its plan to increase its uranium enrichment capacity took it close to a "red line". "It is always dangerous to flirt with red lines," he said, though he stressed that these plans did not constitute a breach of the 2015 nuclear deal signed between Iran and world powers. Meanwhile, Macron’s office confirmed on Tuesday that a previously agreed ministerial meeting between all the remaining signatories of the deal, the European powers, China and Russia, would be held in the coming weeks in Vienna. French diplomatic sources said the meeting was likely to take place during the week of June 25.